The world's smallest ScanSnap. 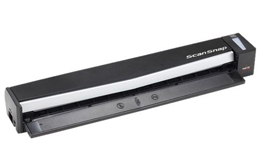 The ScanSnap S1100 document scanner pushes the limits of size and weight for extreme mobility. Includes: Cross-platform functionality (Windows and Mac OS), flexible two way paper path: straight-path and turn-path feeding, and plastic card scanning (supports embossed cards). Just press the "SCAN" button and ScanSnap S1100 feeds a document in about 7.5 seconds in color and at an astounding 300 dpi quality. The S1100 automatically recognizes the size of each document, detects and corrects for skew, and shows images in their proper orientation without operator intervention. With ScanSnap, operators can remain connected with their scanned documents. The ScanSnap S1100 can automatically convert scanned data into searchable PDF files at the press of its scan button. Users can also use a colored highlighter pen on a black & white document to create searchable keywords automatically. Scanning a multiple page document is as easy as inserting the next page with the automatic page detection sensor. 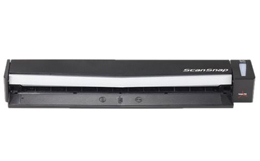 Each time a subsequent sheet is inserted by the operator, ScanSnap S1100 pulls the next page. When the job is done, just press the scan button to close the task to send the scans on their way. For added mobile convenience, the Fujitsu ScanSnap S1100 is powered by a single USB cable. The optional Quick Menu allows users to quickly transition between different scanning intentions. ADF Feeder Paper Size Min. - W x L Min: 1 x 1 in. This featherweight champion packs quite a punch. 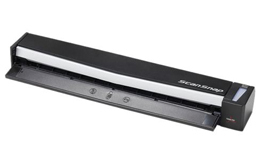 The ScanSnap S1100 is our most mobile ScanSnap ever. It's weight (12.3 ounces) makes it feel almost non-existent in a carry-on, and it's dimensions let it fit practically anywhere. Scan all the paperwork you encounter from full-size documents to business cards and receipts and quickly get them out of the way and off your mind. quickly. Scan a color, letter-size sheet in 7.5 seconds flat. Feed Detection (CFD), just insert the next page, ScanSnap takes the paper in and the effort out. The ScanSnap S1100 can accommodate scanning plastic cards so you can finally back up the important data you carry around in your wallet. The optional Quick Menu allows you to quickly transition between different scanning intentions. • Scan to Cloud: Scan to Evernote®, Google®Docs™, Salesforce CRM, Salesforce Chatter, SugarSync and SharePoint Online (for Windows®). * Rack2-Filer is provided as a 30-day trial only with this product. For full license version, see S1100 Deluxe Bundle (Part: PA03610-B015). Scan to PowerPoint and Rack2-Filer are for use on PC (Windows) only. Evernote (Win/Mac) must be installed on the computer. A Google account (a free service) is required to use Google Docs.